Now that we’ve completed the major remodeling projects in our new-to-us twenty year old home, I’m going through the house, room by room, to decorate them. 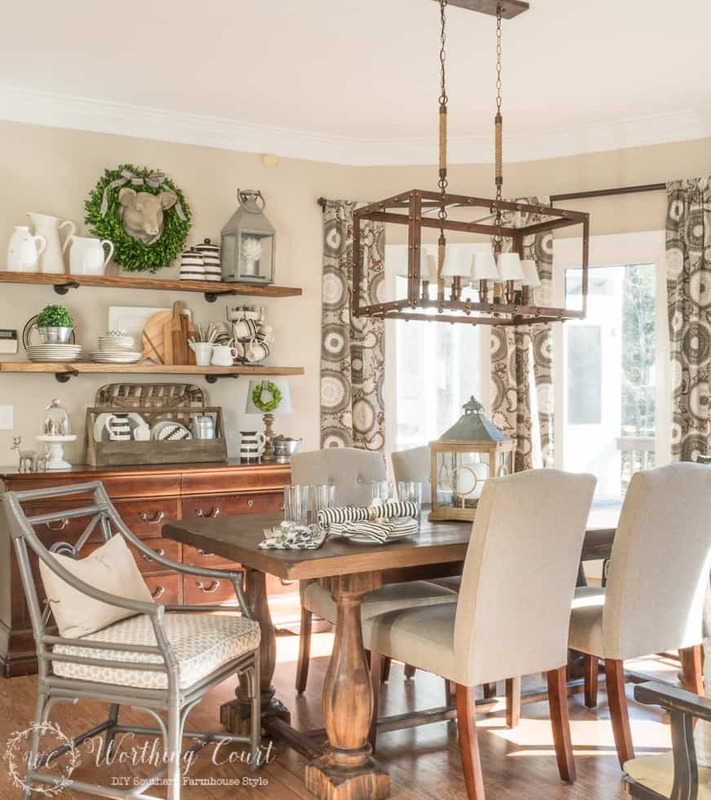 Right now, I’m working on our dining room and I wrote about my plans and my struggle with my decorating disorder HERE. If you haven’t chimed in yet, I’d still love your input on what I should do – so far, I’ve been given some fantastic ideas! We’ve completed the kitchen, breakfast area, laundry room, screen porch and family room. 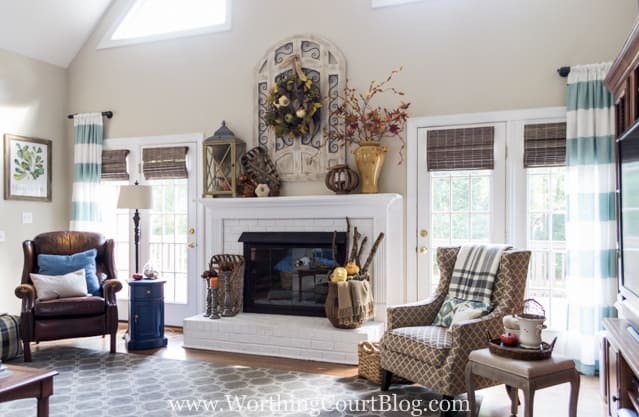 I’ve been sharing reveals along the way and have gotten so many questions about some of the items I used that I thought I’d put my sources for the most frequently asked about ones together in a post. Click on the text directly below each image to be taken directly to each product. Some affiliate links have been used. There is NO additional cost to you. See my full disclosure policy HERE. First up is the large metal and wood piece above my fireplace. It came from Kirklands and is available in more than one finish. I get asked about the wreath a lot too. It’s a 24″ grapevine wreath that I simply wired three greenery garlands to. 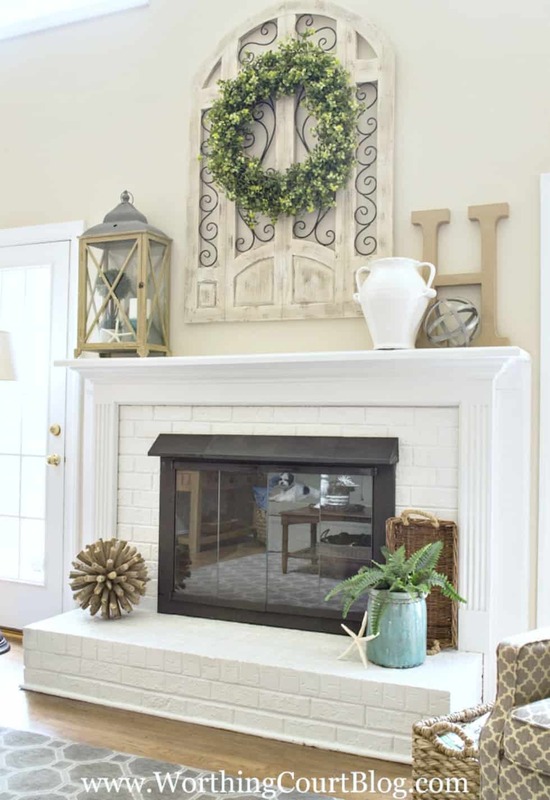 See the before and after of the fireplace makeover HERE. A lot of people are also interested in the budget window treatments that I shared from my family room. There are several items that I received lots of questions about in my breakfast area. See the full reveal HERE. Another item that I get asked about over and over is in my kitchen. It’s the lidded container at my hot drink bar that I keep all of my drink pods in. Mine came from my local Michael’s store. I saw one in the same store the other day, but I don’t think they sell it online. I’ve recommended a similar one from Wayfair to several people, who have purchased it and tell me they’re very happy with it. See the entire kitchen HERE. 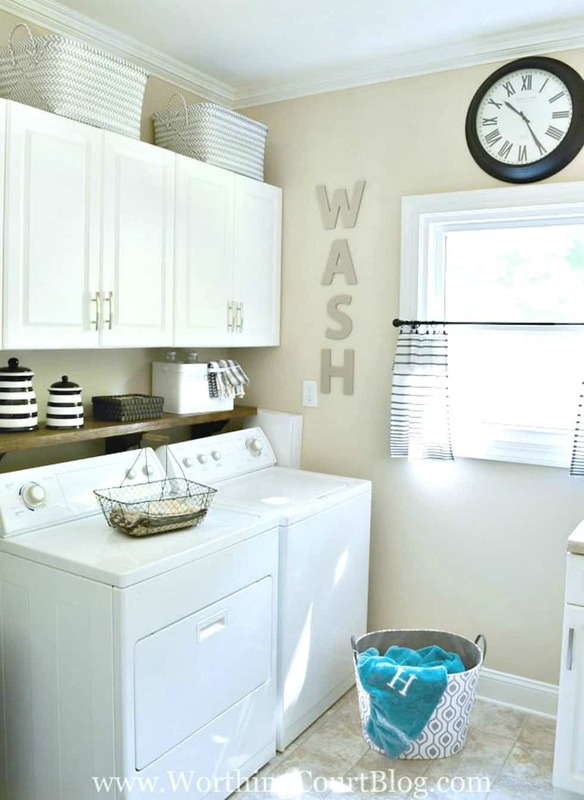 My laundry room is another room that has a few items in it that I get asked about a lot too. See the full reveal HERE. That pretty much covers what I get asked about the most. Let me know if you’d like to know about something different. I hope you found this resource list helpful! Your home looks like a show home. It’s gorgeous. No wonder you get so many questions about it. One question from me, can I borrow you to restyle my home 🙂 or at least your vision. You have such a beautiful home! It’s so lovely of you to share all your resources with us. New homeowners like me love getting inspiration from decors like yours. Lovely of you to join us on #SHINEbloghop this week. Have a great weekend! Your house is beautiful! Can’t wait to explore more of your blog! 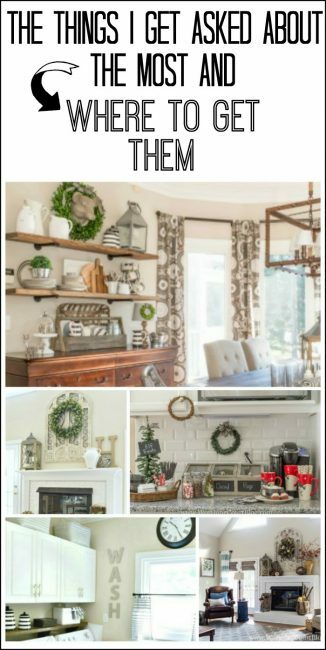 Wow, Such a gorgeous home.Thank you for linking up with us @ #HomeMattersParty. We would love to see you again. Oooo I am loving your kitchen and the 3 sections wooden box, so cute!!! We are featuring you this week on the #OMHGWW hope you can stop by and share other posts. I think I have some of those shades in my house, now that you mention it! Great post; I always love looking at your transformations. Thanks for sharing this with us on Throwback Thursday! Absolutely stunning home. I have to get to work on mine! Thanks for sharing at #SaucySaturdays. Absolutely love your home. What paint color did you use for the interior of your home? I love that is is not a grey but does not appear yellow either. Thank you so much, Meg! We used Sherwin Williams Accessible Beige throughout our house. Love your home. You give me a lot of inspiration. Where did you get the tool box? I love your fireplace!!! Where did you get your driftwood /wooden spikey ball thingy??? Hi Sierra. I found that spikey thingy at West Elm a few years ago. You are always an inspiration, but you make me do things I hadn’t planned to do. LOL. Always for the better though!!!! 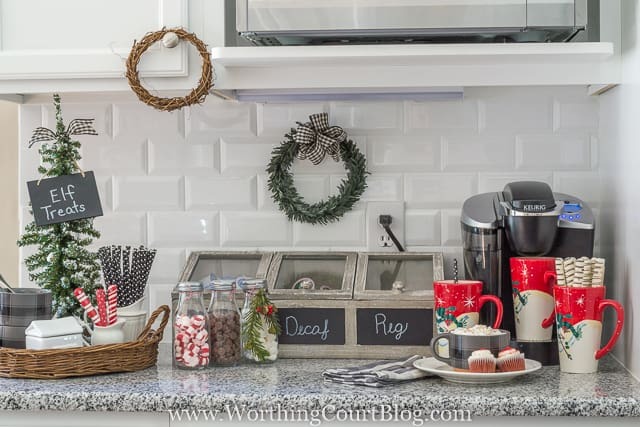 I just love your decorating style and adore your blog! Keep the posts coming!! 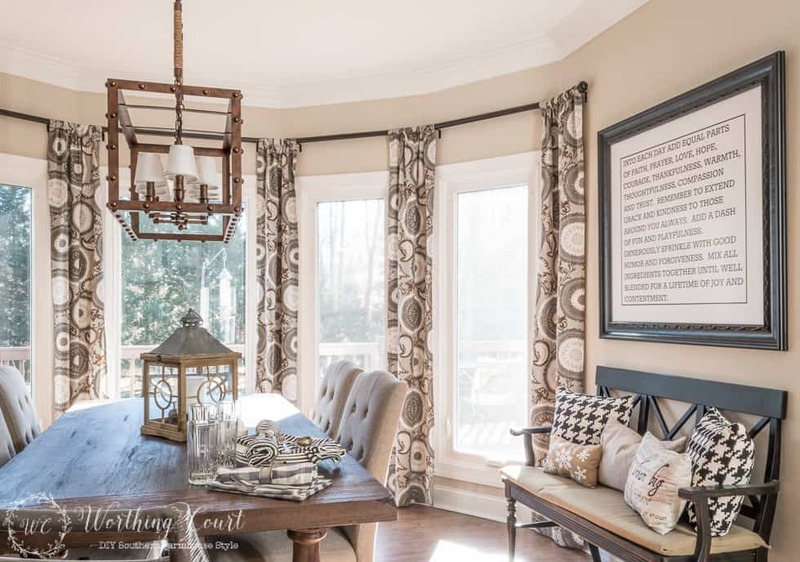 Stumbled upon this post from a Pinterest rabbit hole I am in, and I wondered if you could tell me about the short curtain rods with your striped drapes. Those are the exact curtains I have chosen for my living room, but I’m having trouble thinking of how to hang them. How long are yours? Where did you get them? Thanks in advance. Your home is gorgeous!